5 West Campbell Street, Glasgow. This old pub was established in 1854 owned by John Caldwell. In 1899 Thomas Kirkham occupied the premises paying an annul rent of £95.00, he also owned a pub in Ingram Street. 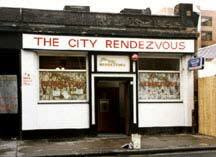 When Mr E J McMonagle took over the pub he renamed it The City Rendezvous he owned a pub in the south side of the city called the Rendezvous. The last licensee was Kathleen, it's sad to see this old favourite is now demolished like many of the old pubs in this part of the city. This old pub was also known as the Flowing Bowl. 1950 Improved Public Houses Scotland Ltd.